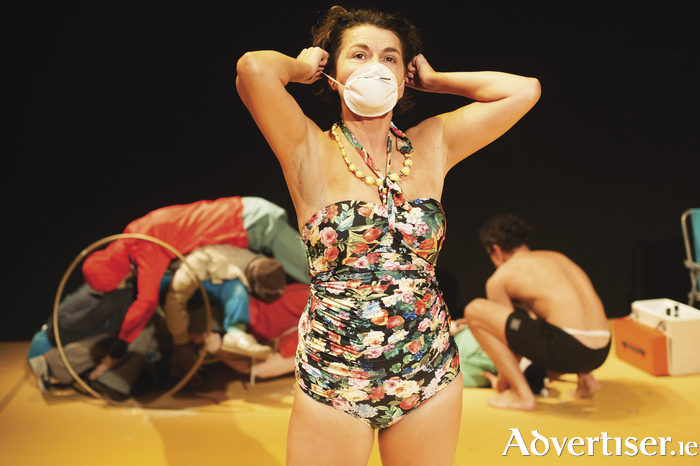 MUCH ACCLAIMED, multi-award winning, Dublin company Brokentalkers make a welcome return to Galway with This Beach, a blistering satire of white western privileged attitudes to Europe’s refugee crisis. The action unfolds on a private beach owned for generations by a wealthy European family. They are celebrating a wedding when, in the midst of the festivities, a stranger arrives unexpectedly on their shore, and the family must decide how to deal with this unexpected incomer. As the sand in This Beach is dug into and the past is excavated on stage, the beach becomes in turn an appealing leisure amenity, a valuable possession, a site of invasion, and a theatre of war. This Beach is sharply written and keenly observed, incorporating Brokentalkers' trademark style of telling stories of social importance in an innovative way. The play is co-written and directed by Brokentalkers’ founders Feidlim Cannon and Gary Keegan and began when the duo were approached in 2014 by the Europoly festival with the Munich Kammerspiele. Brokentalkers were invited to be the Irish artists in a group of pan-European artists making work about Europe. As part of that process Keegan and Cannon visited a refugee camp in Germany to begin research for the play, a visit which radically altered their conception of what they would go on to write. “Like most people living in this part of Europe we see images of refugees crossing the Mediterranean or overland to Greece from Turkey," says Gary Keegan. "There is a disconnect between what we see on TV or in the newspapers and the reality. When Feidlim and I were originally commissioned to write a play about the refugee crisis by the Kammerspiele our first impulse was to meet with people who had made that journey. From that we gained a vital insight into how we would proceed with the process. "We had initially intended to create a piece based on the experiences of refugees, similar to the approach we had taken in our other productions, such as Blue Boy, where we interview people, take their stories and devise a piece around what we heard, but when we arrived into the camp we discovered they already had their own theatre group making good work. While it addresses a very serious issue, This Beach is humorous, lively, colourful, and sharp in its treatment of the subject so there are plenty of laughs amid its thought-provoking. Also, whereas previous Brokentalkers productions come under the umbrella of documentary theatre, Keegan readily describes This Beach as their first ‘proper’ play, with Keegan and Cannon relishing the writing process. One interesting ‘documentary’ element the company did retain is that the first names of the characters in the play co-incide with those of the actors portraying them. “We couldn’t bring ourselves to make up names for them,” Keegan explains. “It was weird enough to write a play, this is our first one essentially even though we have been working for over a decade. It seemed too much to invent names so we left them as they were, but the characters are not based on the actors’ personalities.